of the country, and are also announced on the university and the college websites. The prospectus and admission form are available at the college’s admission office @ Rs.2000/- Requests by mail should be addressed to the Admission Office and accompanied by a bank draft of Rs.2200/-payable to Bahria University. Overseas and foreign candidates are required to enclose a bank draft of US$ on any bank that has a branch in Karachi and Islamabad. Cheques and postal orders are not accepted. Please do not send cash by post. Applications aspiring to join the Medical & Dental programs at Bahria University Medical & Dental College are advised to read the eligibility criteria for application carefully. Admission to a medical and Dental institutions is always competitive and very well contested. Applicants are advised to prepare for the admission process seriously and with commitment. Provisional application can be submitted with HSSC Part-I along with a hope certificate by those who have already appeared in HSSC Part-II examination and are awaiting result. However, awaiting result must reach Admission Office latest by the day of Entry Test. Failing this, all provisional application forms will cease to receive attention after this date and no further communication to this applicant. The candidates who has passed any other examination of a foreign university or examining body, which contains the subjects declared as essential by PMDC in scope and standard, is found equivalent upon certification by the IBCC to the Intermediate Science (F.SC. with 60% marks) Examination of a Pakistani university or Board of Secondary Education, shall be eligible to take the entry test for admission in MBBS. The candidate who has passed an examination higher than the F.Sc of a Pakistani University with Biological Sciences provided he / she has passed the intermediate Science (F.Sc. Examination) (Medical Group) securing at least 60 % marks in aggregate, unadjusted , from a Pakistani university or an equivalent examination of a Board of Secondary Education in Pakistan shall be eligible to take the entry test for admission in MBBS. a. The candidate who has passed an examination equivalent to intermediate level of Pakistan from a foreign education system with three science subjects out of which Biology and chemistry are essential subjects with 60 % marks in each as certified by IBCC, is eligible to appear in the entry test of MBBS. On open merit through the provincial entry test. Subject wise equivalence by IBCC shall be acceptable; study group mentioned by IBCC shall have no effect on the eligibility for admission, if any. b. On foreign seats only and not on open merit seats, in lieu of the entry test of the admission authority , the candidates is required to have passed SAT II examination score with minimum 550 marks in each of the three science subjects of which two have to be Biology and Chemistry. c. The candidate is required to present a valid TOEFL or IELT with a score of 500 or 5.5 only if the medium of instruction of study two years prior to application for admission/entry test is not English. An alternate to TOEFL and IELT is a certification by NUML Islamabad after a one year English language course. 1. 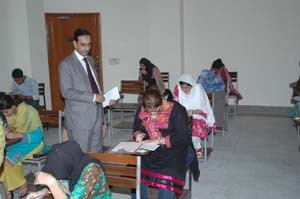 Pakistani national student having passed an examination equivalent to intermediate level of Pakistan after study abroad from a foreign education system with three science subject out of which Biology and chemistry are essential subjects with 60 % marks in each as certified by IBCC, is eligible to appear in the entry test for admission in MBBS. Subject wise equivalence by IBCC shall be acceptable irrespective of study group mentioned by IBCC if any. In lieu of the entry test of the admission authority, the candidates is required to have passed SAT II examination score with minimum 550 marks in each of the three science subjects of which two have to be Biology and Chemistry. The candidate is required to present a valid TOEFL or IELT with a score of 500 or 5.5 only if the medium of instruction of study two years prior to application for admission/entry test is not English. An alternate to TOEFL and IELT is a certification by NUML Islamabad after a one year English Language course. 2. Foreigners and Pakistani having dual nationality shall be eligible for admission on foreign / overseas seats irrespective of the place of their premedical study, Pakistan or abroad. They shall either have to appear in the entry test or present the admitting authority / University with the requisite SAT scores and entry test marks. The candidate is required to have passed intermediate from a Pakistan board or an examination equivalent to intermediate level of Pakistan after study abroad from a foreign education system with three science subjects out of which Biology and Chemistry are essential subjects with 60 % marks in each as certified by IBCC, is eligible to appear in the entry test for admission in MBBS Subject wise equivalence by IBCC shall be acceptable irrespective of study group mentioned by IBCC, if any . In lieu of the entry test of the admission authority, the candidate is required to have passed SAT II examination score with minimum 550 marks in each of the three science subjects of which two have to be Biology and Chemistry. The candidate is required to present a valid TOEFL or IELT with a score of 500 or 5.5 only if the medium of instruction of study two years prior to application for admission/entry test is not English. An alternate to TOEFL and IELT is a certification by NUML Islamabad after a one year English language course. 3. Pakistani students who have studied abroad for premedical but appearing in the Pakistani boards from abroad are also eligible. They shall either have to appear in the entry test or present the admitting authority / University with the requisite SAT scores and entry test marks. The candidate is required to have passed intermediate from a Pakistan board or an examination equivalent to intermediate level of Pakistan after study abroad from a foreign education system with three science subjects out of which Biology and Chemistry are essential subjects with 60 % marks in each as certified by IBCC, is eligible to appear in the entry test for admission in MBBS / BDS. Subject wise equivalence by IBCC shall be acceptable irrespective of study group mentioned by IBCC, if any. In lieu of the entry test of the admission authority, the candidate is required to have passed SAT II examination score with minimum 550 marks in each of the three science subjects or which two have to be Biology and Chemistry. The candidate is required to present a valid TOEFL or IELT with a score of 500 or 5.5 only if the medium of instruction of study two years prior to application for admission / entry test is not English. An alternate to TOEFL and IELT is a certification by NUML Islamabad after one year English language course. There shall be no minimum or maximum age limit for admission in MBBS / BDS program. All applicants will be required to take the college entry test. The entry test is an essential segment of the admission process. As an alternate Overseas and Foreign Candidates having minimum SAT II score 550 marks in each three science subjects of which two has to be Biology and Chemistry are exempted entry test and shall be required to appear in the interview. The entry test is conducted on campus , or at locations as advertised. The test encompasses questions on Biology , Chemistry, Physics and English (HSSC level). The duration of the test is 2 hours, and the format is a series of Multiple-Choice Questions (MCQs) on each subject. Before the test, each applicant is issued an entry Test Card, which outlines the necessary instructions. Candidates are not allowed to enter the exam hall without this card. The results of the entry test are subsequently made available on the university website. Interviews are part of verification of original credentials, meeting with candidates and his / her parents / guardian. Applicants are cautioned that interviews, although held towards the end of the admission process, are only one component of the whole process and contribute a small weight age to the cumulative merit. It is very rare that a candidate is rejected on the basis of his / her interview. The relative weight ages of all the components of admission process are added up to prepare the final merit list. The top applicants on the merit list are invited, in writing, to join the first-year MBBS class. No formal waiting list is announced, but all the remaining applicants stay on the waiting list. Any dropouts from the class are replaced by candidates on the waiting list, according to merit, before commencement of classes. Selected students are required to confirm their intent to join the college by depositing the admission fee, tuition fee and other fees, within the stipulated period. If a seat in the fifty-year class is not confirmed by this date, it is offered to the next person on the waiting list. No further claim of admission by the incumbent applicant is valid in such an eventuality.